Beautiful 'old Tahoe' style cabin located on the picturesque West Shore of Lake Tahoe in Skyland. Four houses from Lake, just about a block from the Lake where Skyland's private beach and pier are. The bike trail is also along Lake. Our cabin backs up to the Kaspian State Park (Blackwood Canyon) where you can hike, or even cross country ski right out the back door of the cabin. Our cabin easily sleeps six - eight. There are three bedrooms. One has a king size bed, one has a queen, and one has two twin beds. There is also 2 Queen Size futons in the family room. There are two full baths. two showers one over a whirpool tub. The cabin is fully equipped. All you have to bring is your food and clothes. The kitchen has just about everything, and is a joy to work in with a new gas 5 burner Bosh range,, new French door refrigerator with an ice maker. All bed and bath linens are provided for number of people reserved.. There is a basement family room with a full size POOL TABLE, New 4k Smart HDTV, and a wood stove. We have high speed Wi Fi. TV's are in all the bedrooms, the living room and the family room. The living room has a 50" HD Smart TV so you can watch Netflix or any internet based programming. The family/pool room has a new 4k Smart TV. Two of the bedroom have HDTV. The upstairs back bedroom is an old CRT TV. The living room has surround sound, CD, DVD, & Blue Ray. For parking, there is a two car attached garage, with auto garage opener. There is additional parking for about 4 cars, on the driveway which is kept plowed. Grandma Walker bought it for our vacation home. We are constantly updating and improving it. We just added a huge covered deck that connects to 3 sides of the home, and new kitchen appliances.. The area along the side of our Lake, 4 houses away, has the longest stretch of public beach to walk along on the entire lake. We love to take walks in the morning and evening, or bike along side the Lake. People come from all over just to be able to take long walks, bike, and picnic along our West Shore. Out back, you can hike or bike along the road near Blackwood Creek. Our neighborhood is very quiet, and peaceful. Our back yard is flat. The neighborhood annual party is always in our back yard. We host about 50 people. 'The Honeymoon House' is it's nick name. There have been several weddings in our back yard, and many honeymoons.. Peak of Lake from deck, upstairs and yards. Four houses from Lake, 1 block. There is a very filtered view of the lake from the decks. There is a private beach and pier. The cabin backs up to Kaspian State Park and Blackwood Creek. The cabin backs up to the state park for some great cross country skiing. In garage and on driveway. On the street during the summer. 2 Car garage with opener. There is a snow plowing service for the driveway. It's a new QUIET Bosch, what else is there to say. New, and Large enough for 9 x 12 cassrole dish. Wide Opening for thick bread or English Muffins. Fully equipped with everything but the food. New 4k TV in the family room. HDTV everywhere else except the upstairs back bedroom that still has an old CRT. All cable. Living room, Family/pool room, and all bedrooms. HD in all but upstairs back bedroom. DVR in living room and downstairs bedroom. Full surround sound in living room. Family room, back bedroom and living room which is also blue ray. DVR in living room and downstairs bedroom. Various board games, cards, etc. Nice big mostly level back yard. Cabin has a wrap around deck on three sides. The lake and our subdivision's private pier is just a block away. Deck on 3 sides, large portion faces back forest. Huge covered deck with beautiful, large rod iron table and chairs, seats 8. The nearest golf course is in Tahoe City. Only the pool/family room downstairs and the garage are the only rooms accessible to someone in a wheelchair. The backyard is flat as well. We had a great time 😊� the grand kids enjoyed playing in the back yard filled with snow ! Enjoyed our stay as well as your home ! Thanks for having. Us ! We had an amazing time at this home! It was very charming and warm! The house had everything you could ever need and more. It felt like we were staying at our home away from home. It’s walking distance to the lake so we also got to enjoy a beautiful Tahoe sunset! Thank you for hosting us, we had an amazing weekend, all because of the quality and love in this home. We had a fabulous time and will return! The Walker cabin was well enjoyed by our family and visiting guests from French Polynesia (who are also HomeAway hosts). Especially appreciated were the traditional interior of knotty pine, excellent kitchen appliances, comfortable beds and the cheery wood stove. There is a wide variety of bowls, dishes, and cookware that make preparing food simple easy. The dining table has leaves which allowed us to invite our local family members over for dinner and we gathered in the living/dining area comfortably. Incidentally, there is ample firewood and a great propane grill on the porch which we used for our meal preps. The location is ideal for accessing winter sports in the Tahoe area. It took us around 25 minutes to get to Squaw Valley and minutes to get to Tahoe City. We arrived after the largest snowfall in Tahoe history....so there were a few issues with accessing the property. The last guest failed to leave a key in the lockbox; we could not gain access to the garage (or snow shovels) as the keypad did not work; snowplows left a large berm in the driveway and the cable and internet were inoperable as the storm took the line out. ALL OF THESE THINGS ARE OUT of the owner's ability to control and Steve quickly replied with alternatives and even hired a local to come shovel the garage entry for us. He was helpful and responsive which we really appreciated. And, we preferred the absence of cable TV as it gave us the chance to actually SOCIALIZE and visit around the fire instead of viewing the tube. I give this property a 4 simply due to the fact that there is not an onsite local manager to check the property between guests which could have made our arrival a little easier. Still, you are going to Tahoe in winter and must expect some road and snow conditions to pop up. The charming ambience really impressed our friends and gave us and them the perfect mountain experience. We would return to this property. We got snowed in last day of our stay with roads closed and owner Steve Walker was so supportive and allowed us to stay another night. 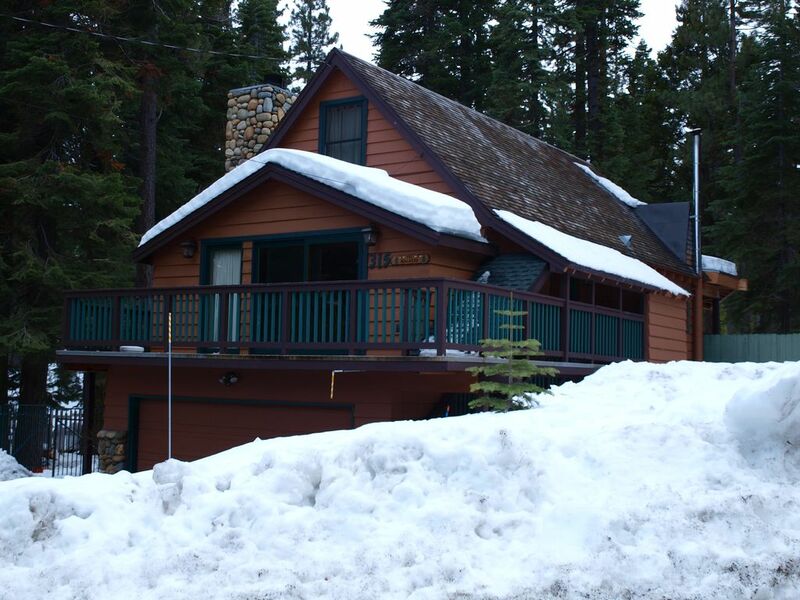 We're located in Skyland on the West Shore of Lake Tahoe between Sunnyside and Homewood. We're just four doors up from the Lake where we have access to a private beach and pier. You can go cross country skiing or hiking right out the back door since we back up to the Kaspian State Park. The linked calendar is the official calendar. If you call me to check availability, this is the calendar I will check. Your reservation is not confirmed until payment has been received.